KIRIN was founded in the port town of Yokohama, just south of Tokyo in Japan, in 1888 – making it one of Japan’s oldest breweries. For more than a century KIRIN has embodied the Japanese spirit of ingenuity and craftsmanship, respecting time-honoured traditions that harness the purity of ingredients to create premium international beers. First Press describes the craft of extracting only the first press of liquid from the malt, when ingredients are at their purest, much like extra virgin olive oil. Most brewers use a blend of first and second pressed malt liquid, however KIRIN is the only beer in the world to use the First Press method. 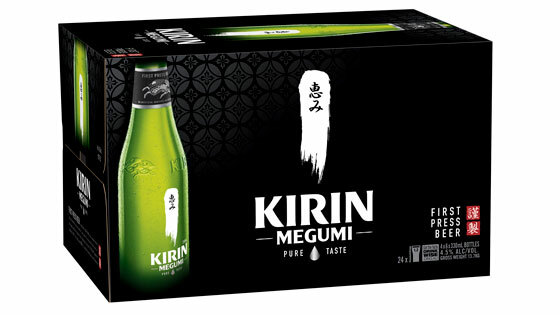 It is this method that has been pioneered and mastered by KIRIN and is how KIRIN gets its unique, balanced, pure taste. KIRIN keeps all ingredients in their purest natural form through an unwavering commitment to quality. KIRIN is steeped in Japanese tradition, driven by an unwavering commitment to stripping away the complex and unnecessary. KIRIN considers brewing an art that is never perfected, demanding focus and ingenuity. Science plays an indispensable role in brewing, but ultimately it comes down to the five human senses, and we brew exquisitely crafted yet pure premium international beer. Sapporo is actually the oldest brewery in Japan – founded in 1876. Kirin followed in 1888, and a year later, Asahi Breweries (originally the Osaka Beer Brewing Company) in 1889, with the launch of the Asahi Beer brand in 1892. These three mighty beer brands still dominate the Japanese beer scene today, and were all established within 16 years of each other. Love premium beer? So do we!